Aquaclean Solvent Based Stain Remover is a solvent based cleaner for removal of oil based stains from carpets, upholstery, fabrics and other hard surfaces. Effectively dissolves, greases, oils, tar, glues and other petroleum based spillages. Always pre-test carpet or other fabric materials to ensure that they are colourfast. Lift as much soiling as possible. 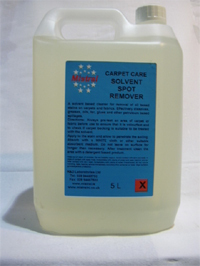 Spray Solvent Spot Remover directly onto stain and allow it to penetrate the soiling. Absorb with a WHITE cloth or other suitable absorbent medium. Do not leave on surface for longer than necessary. After treatment clean the area with a detergent based product.